Last week, I figured out that the last movie I went to see a movie house was Burn After Reading, my boyfriend George's movie. That was seven months ago. I know! If you know me at all, you know that I must be on crack, or something's off-kilter. I mean, I'm usually the girl who must see a movie the second it comes out. There's no real reason for it, I didn't even notice, to be honest. And, since this is a magnetblog, I don't even want to delve into this unJoylike behavior, thank you. So anyway, this magnet is from one of my favorite movie houses in town. Seriously - 25 houses, all in one. In the middle of Midtown! 25! Hmmm, I wonder if I've even been in all 25. It's gorgeous - this cinematic treasure was opened in 1912, and went through several iterations as the Eltinge (where some famous actor [Eltinge] did female impersonations - seriously, although apparently Gable and Olivier played it, too! 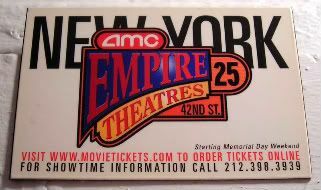 ), and then as the Laffmovie (Hahahaha - clever) movie house, and then finally the Empire movie house, before closing down in the 80s. When I first moved here, it was this tiny little building down the block. Then a developer with big plans for 42nd street decided to do something with it. They picked up the building and moved it. Like 170 feet. Down the street. I kid you not. Then, they finished off the renovation by building the movie house around and beside it. One day it was close to Port Authority, and the next, they were toward the middle of the block. It's no big thing, for sure, buildings all around the world are moved all the time. But, here? In New York? The city that will keep razing and building and razing and building until there's not a patch of green grass left? No way! It's absolutely amazing that someone would actually give an old building a second life, by preserving and reusing it, versus just razing the heck out of it. So, yay for a great comeback, Empire! Lucky us. Or me, rather. This many theatres and this many movies in this one complex makes it one of the best places in town to do an all-day movie marathon in - and yes, I pay for all three (or four) movies, rather than sneaking from one house to another. Well, most of the good movies out lately have been uber-depressing, like Doubt or anything starring Kate Winslet. I haven't wanted to see anything in the theater for awhile. Since last July I've only seen Slumdog Millionaire and The Watchmen. Yeah. I actually think I'm going to break my movie sabbatical this weekend by going to see Fast & Furious, because seriously, I love those movies. Plus, it's just totally *me* to break my fast for hot boys with hot cars. But there's a *big* part of me that wants to do an all-day movie marathon in May for Wolverine, Star Trek, and Terminator: Salvation. Hmmm. Decisions. ::gasps:: Totally forgot about Terminator! Yep, all kinds of goodies coming up. I heard F&F was all kinds of terrible, 1/4 stars kind of thing. I didn't want to believe it, so if you see it, please let me know your opinion?